ZT 11P Carbon Fiber Swivel Key - Black Includes 1.5 inch steel keyring. Lifetime Guaranty from ZAK Tool. 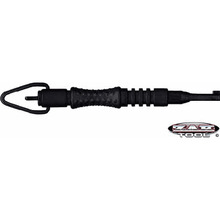 This handcuff key is larger for a better grip, no fumble experience. Carbon Fiber is lightweight, but very strong so this key will be durable, but you won't feel it on your keyring.